(CNN) -- France's Thomas Levet secured the fifth European Tour victory of his career by winning the Spanish Open in Girona by two strokes on Sunday. 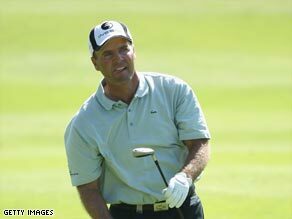 Thomas Levet dedicated his fifth European Tour victory in Girona to the ailing Seve Ballesteros. Levet carded a four-under-par 68 to hold off Paraguay's Fabrizio Zanotti with Ireland's defending champion Peter Lawrie and Dane Thomas Bjorn joint third. Two strokes ahead overnight, Levet soon found himself two shots in arrears after four holes, with playing partner Stuart Davis bursting clear with three successive birdie. Davis, a Tour rookie despite being 35, eventually fell away to finish in 15th place after carding a 78, but Zanotti, Lawrie and Bjorn then came on strong. Zanotti had never previously posted a top-10 finish, but he had nine birdies in a best-of-the-day 65. However, it did not prove enough to beat Levet, who sank an eight-foot putt at the long 15th and then birdied the 460-yard 17th to secure his win. After his round, former Ryder Cup player Levet dedicated his victory to Seve Ballesteros, who underwent four operations last year after the discovery of a brain tumor and is still having chemotherapy. "I always think about Seve, he is having a hard time at the moment," the 40-year-old told reporters, after completing his 72 holes on 270 (-18). Then, looking into a television camera, Levet added: "Seve, I dedicate this win to you."